If you’ve ever wanted to see the world’s largest orchid plant in bloom, now is your chance. 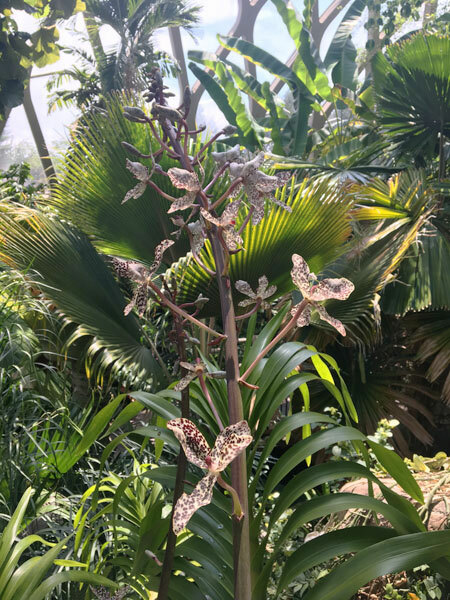 While there are taller orchid plants and larger orchid flowers, the overall mass of Grammatophyllum speciosum has earned it recognition as the world’s largest orchid and it is now in bloom in our Boettcher Memorial Tropical Conservatory. 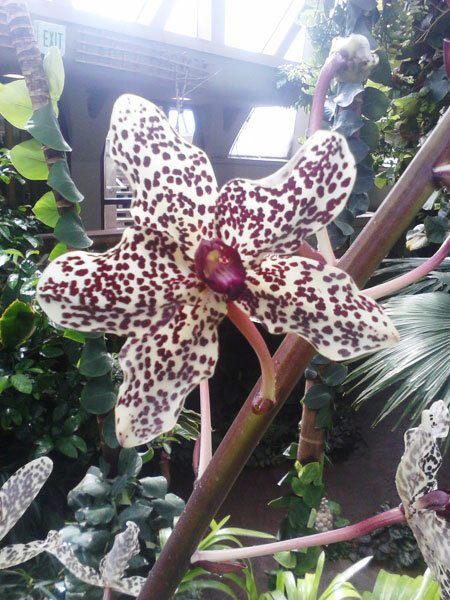 Also known as the sugarcane orchid because of its foliage, G. speciosum is a native of Malaysia, Sumatra and New Guinea. Years ago on a trip to Malaysia, I saw specimens growing as epiphytes on tree trunks over 100 feet in the air. Many more specimens were in public and private gardens as they are popular plants for rescue when large trees are cut down. Our plant and its blossoms are most easily viewed by entering the upper level conservatory doors off the main lobby. Walk along the north wall and about 15 feet or so in, look to the south over the ledge and you will see the sugarcane-like leaves and the maroon and white blooms. The real plant nerds among may notice that the lowest flowers are botanically imperfect. Further up the inflorescence, the flowers become perfect. Weird and wonderful!